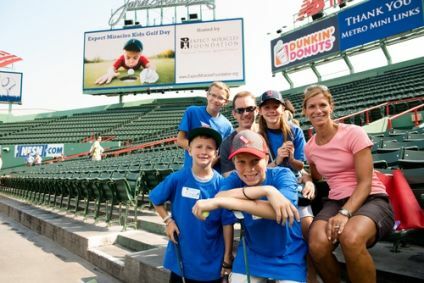 This year, Expect Miracles Foundation expanded its Kids Golf Program and brought the 2012 Expect Miracles Kids Golf Day to historic Fenway Park for the Park’s 100th Anniversary! Over 100 children impacted by cancer and their families joined us on August 1st for an unforgettable day. The families started the morning by enjoying breakfast courtesy of Dunkin’ Donuts. Families got to explore special parts of Fenway Park through ballpark tours and a fun scavenger hunt for the kids. Arts and crafts stations gave families a chance to relax at the picnic tables and work on activities together. Kids enjoyed coloring their own baseball to bring home in a special case. They also each designed a special puzzle piece, which when joined together, created a beautiful montage of their experience. The highlight of the day was a custom 9- hole mini golf course built by Metro Minilinks. It was a huge hit among kids and adults alike. Congrats to Trent K. who got the first hole-in-one ever at Fenway Park! Everyone turned in their scorecards at the last hole for a drawing to win amazing prizes like Red Sox tickets. Continuing with the golf theme, PGA professional Jim Tennant and his team led the kids in a golf skills clinic, practicing swing, stance and driving through interactive drills. As a special surprise, each child was given his very own putter to continue practicing at home. We even hear Michael S. and Samantha S. are ready for the PGA tour! The Foundation was honored to have JP Morgan as a Proud Partner of Expect Miracles Kids Golf Day. JP Morgan volunteers contributed their time at this community event, joining other volunteers from the industry to lead activity stations and ensure the kids were having fun. Following the event, families, volunteers, and sponsors gathered on Fenway’s Right Field Roof Deck to enjoy a lunch filled with popular Fenway fan favorites and a chance to take photos with the World Series trophies. As an added surprise, kids got to see their name on the Red Sox scoreboard. Everyone got to take home a bag filled with goodies like a beach towel, backpack, waterbottle, and more. Expect Miracles Foundation announced their 2012 College Scholarship recipient, Emilyann Dearborn, on the field at the Red Sox game that evening. Emilyann was first diagnosed in 2010 with Hodgkin's Lymphoma. After completing treatment, she found out that her cancer had returned in the Summer of 2011 and had to put her college plans on hold once again. Despite all she has been through, Emilyann has not let her diagnosis deter her from her goals. She will be attending Prescott College in Prescott Arizona in the Fall and plans to major in English and Adventure Education. Expect Miracles Foundation was thrilled to have so many families join us at Kids Golf Day at Fenway Park. Each family’s story and strength are so inspiring. We hope this event will continue to be embraced by the community and provide a special day for families impacted by cancer for years to come!